I did originally plan to combine the wits of several FG writers to formulate an unbeatable list of predictions for the 83rd Academy Awards before realising that a) predicting this kind of thing is a bit silly and b) it would make it appear like we cared about the Oscars/awards a lot more than we actually do. Nonetheless, I'm going to chime in with some brief thoughts on the main categories. 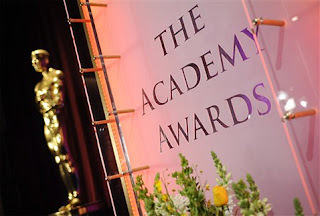 If you wish to have an even earlier before and after, you can also check out my thoughts on the nominations for the 2011 Oscars - where I discussed some of the snubs and surprises. Anyway, onwards to my predictions. Early on in the awards season, it looked like 'The Social Network' was deservedly going to dominate the Oscars. However 'The King's Speech' made a late resurgence and now seems to be the favourite. While I enjoyed both, I feel the former is the standout film of the ten nominees. With competition between 'The King's Speech' and 'The Social Network' so intense, I suspect that the Academy will split the big two categories to reward both. Even though Tom Hooper picked up the DGA award, I think David Fincher will finally get the recognition he deserves from the Academy. The omission of Christopher Nolan from this category still rankles however. It's pretty much nailed on that Colin Firth will win this, after arguably being robbed last year by Jeff Bridges. In another year, one of the hosts of the evening, James Franco, may well have been firm favourite for his performance in the disappointing '127 Hours'. I wasn't as blown away by Natalie Portman in 'Black Swan' as many others but for me, she just edges out Jennifer Lawrence whose performance in 'Winter's Bone' was pretty much the only thing that I enjoyed in that feature. Having dominated the awards season, Portman is also heavy favourite to win. Oddly, Hailee Steinfeld has been nominated in the supporting category rather than lead, and should really be swapped round with Annette Bening, who was nominated in this category. Regardless, I think the warring duo of Amy Adams and Melissa Leo from 'The Fighter' will slug it out, with Leo coming on top, for her more showy performance. Similarly to the supporting actress category, Christian Bale's showy performance in 'The Fighter' has all but secured a deserved first Oscar. His transformation truly has to be seen to be believed. I wouldn't begrudge Geoffrey Rush the award for his turn in 'The King's Speech' but really, this is Bale's time. I'm still flabbergasted that 'The Hurt Locker' won this category last year, not because I hate the film but because the screenplay was its weakest aspect. So predicting this is pretty much pot luck and I'm going with David Seidler and his script for 'The King's Speech'. I'd prefer if Nolan's screenplay for 'Inception' did the business (for its scope and complexity, and in spite of its flaws) but I don't think it will happen. It will be one of the biggest shocks in Oscar history if Aaron Sorkin fails to win this category. Even though it's debateable whether he should really have qualified for "adapted" screenplay, considering he wrote his script independently of the book it was claimed to have been based upon. Anyway, his works transformed what could have been a pedestrian courtroom drama into what is essentially a wordy action film. Part of me feels like 'The Illusionist' deserves this because of its traditional (and exceedingly melancholic) feel, another part of me recalls the sense of adventure of 'How To Train Your Dragon', while the final part of me wonders just how Pixar managed to make another brilliant film. So I'll be happy whatever the outcome here but I suspect that 'Toy Story 3' will come out on top. The 83rd Academy Awards begin around 23.30 in the UK this evening. Good luck if you're intending on staying up. Feel free to add your predictions in the comments.